It’s happening right now: Windows 10 has closed ranks with Windows 7 as the most widely-used system – at least in Europe and the United States with a 30 percent market share each. Those who are only now switching over to Windows 10 will find the latest test helpful in finding the best security package. In the latest test, 18 products were called upon to show their stuff – a total of 5 packages achieved top scores. Windows 10 is becoming more and more popular and attracting many new users every day. Naturally, the fact that Windows 10 was available free of charge for a relatively long time, and every new PC has Windows 10 installed as its operating system, is facilitating its market conquest. Anyone just now switching over or planning to switch to Windows 10 needs a reliable security package. But which one? 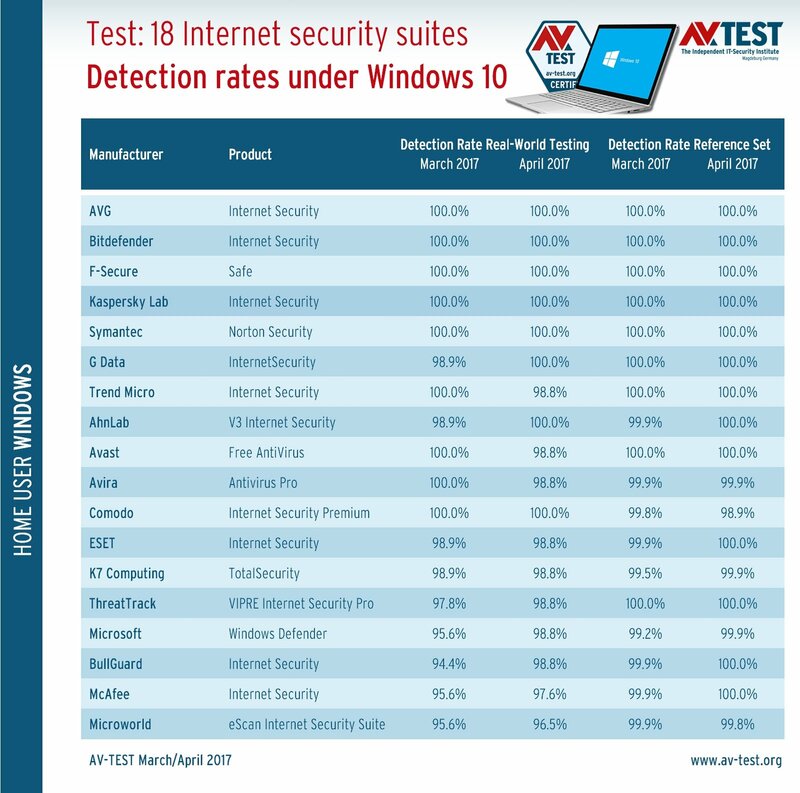 Was the old solution the best under Windows 7 or 8, or do any known security packages offer outstanding performance under Windows 10? The laboratory at AV-TEST has answers to these questions! Five security packages each detected several thousand malware samples up to 100 percent. 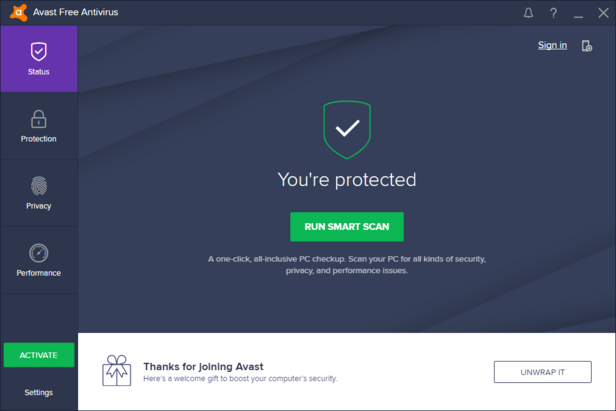 With 18 points and error-free detection, the paid version of Avira’s security suite comes highly recommended. The consistent finisher in the top group also showed error-free performance in this test – 18 Points. The freeware package achieved 16 out of 18 possible points, one point more than Windows Defender. All the known products on the market are found in the test list. The lab evaluated the 18 solutions in March and April 2017 in the categories of protection, performance and usability. In each test category, the solutions received up to 6 points, i.e. a maximum of 18. A total of two products managed to achieve the top score in the test. 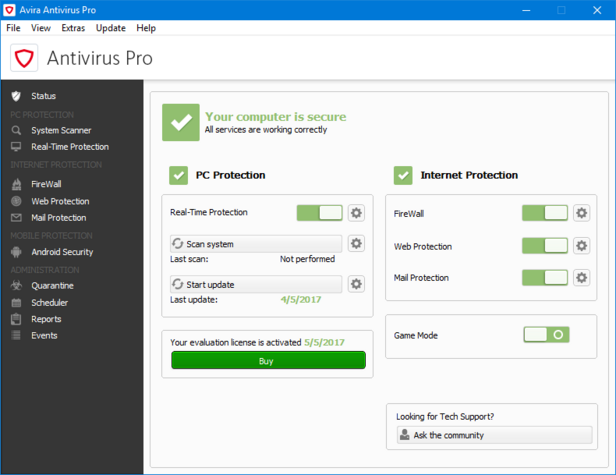 Avira AntiVirus Pro and Kaspersky Internet Security. In addition to the certificate for tested safety, the products also received a TOP PRODUCT rating, as they scored more than 17.5 points. This is followed by the products from Bitdefender, Symantec and Trend Micro with exactly 17.5 points. They also receive the additional TOP PRODUCT rating. The large midfield with 16.5 and 16 points is made up of products from AVG, F-Secure, G Data, AhnLab, Avast, BullGuard, McAfee and Microworld. The remaining products from ESET, ThreatTrack, Comodo, K7 Computing and Microsoft came in at 15.5 and 15 points. In the test for protection, the packages were required to withstand the real-world test, followed by the AV-TEST reference set. In the first section, the goal was to fend off 175 new, still unknown threats, some of which were only a few hours old. By contrast, in the reference set there were 12,000 old acquaintances that were already wreaking havoc up to 2 weeks prior to the beginning of the test. So the packages were expected to be familiar with these threats. In the real-world test, 6 products managed to detect all the threats without exception: AVG, Bitdefender, F-Secure, Kaspersky Lab, Symantec and Comodo. Whereas the first 5 also achieved the 100 percent mark in the test with the reference set, Comodo fell short because it overlooked a few known threats. Overall, however, there were additional products in the test with the reference set that also achieved error-free detection. In addition to the 5 products from AVG, Bitdefender, F-Secure, Kaspersky Lab and Symantec, there are also G Data, Trend Micro, Avast and ThreatTrack. Despite minor errors, ultimately 10 products scored the coveted 6 points in this test category. Does more security slow down the PC? Users continue to complain that the security solution they are using slows down the PC. To verify this, the technicians in the lab install each solution on a standard and a high-end PC. Afterwards, applications are launched, websites are visited or files are copied and the amount of time required to do so is noted. The same test PCs without a security solution deliver the reference values. Naturally, every security suite required a few percentage points of resources – but it was not to exceed that level. The best scores in this test were achieved by the suites from Avira, Bitdefender, BullGuard, Kaspersky Lab, Microworld, Symantec and Trend Micro. All the packages earned 6 points for their performance. The protection packages from F-Secure and McAfee did not require vast resources, but they did need more: 5.5 points. AVG and G Data received 5 points. All additional packages were considerably more conspicuous in everyday use in terms of performance loss: AhnLab, Avast, ThreatTrack, Comodo, Microsoft, ESET and K7 Computing received a mere 4.5 or 4 points. Is this a real alarm or only a false alarm? Users are typically shocked if a red alarm window suddenly pops up when launching a normal application or surfing a favorite website. That is why for each solution, the lab examines whether false positives occur frequently. In the test, 500 websites were visited, programs were installed and launched, and 1.2 million files were scanned. The special feature in this test: all the websites, applications and files were clean – not a threat. Thus, the packages were supposed to respond accordingly. The result is consistently good, especially in detecting the websites. All the products worked error-free in this area. When installing and launching normal applications, there were a few false positives here and there. When scanning the 1.2 million files, the error rate was a maximum of 11 files. That is somewhat annoying in an individual case, but given the volume of files, it is still a good rate. Thus all the products in this test category received between 5 and 6 points. The best results were achieved by Avira, Kaspersky Lab, McAfee, ESET and Microsoft ab. Quick, secure error-free – why wait? 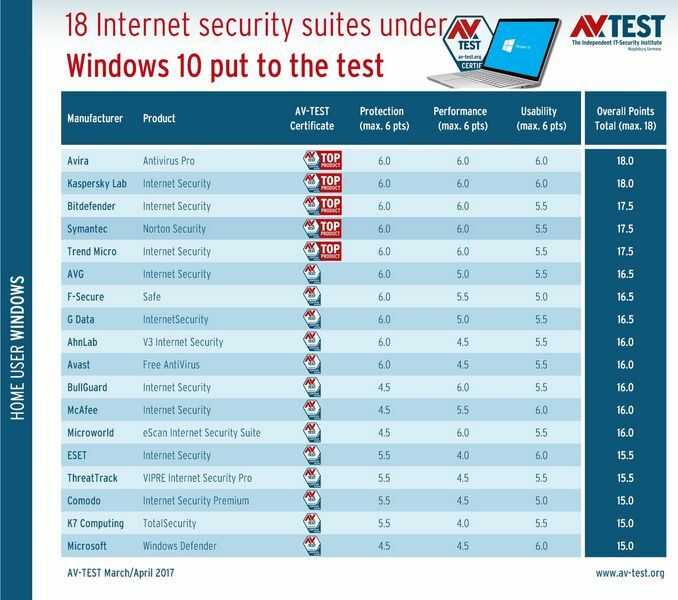 The test of the 18 products under Windows 10 indicates that there are some protection products that offer excellent protection, do not slow down Windows and do not upset the user. 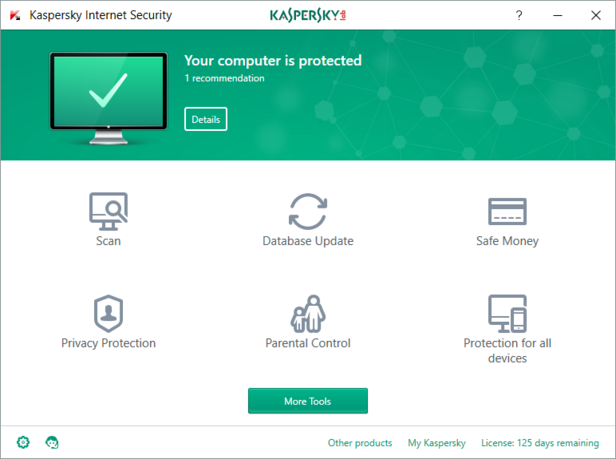 Ranking very high in this category are the products from Avira and Kaspersky Lab with 18 points each. That is the highest score achievable in the test. This is followed by the suites from Bitdefender, Symantec and Trend Micro, also with excellent scores of 17.5 points. All three lost only half a point in the area of false positives. In terms of protection and performance, they are perfect. While the packages from AVG, F-Secure, G Data, AhnLab and Avast only reached 16.5 and 16 points respectively, they have one thing in common: 6 points in the protection category, the most important phase of the test. Anyone looking for a security package for Windows 10 doesn’t have to wait any longer. The test makes it easy to choose the right protection. The attack of the crypto-Trojan WannaCry struck mainly Windows 7 systems on which certain security updates were missing. Under Windows 10, the malicious code apparently did not work, as the exploit was defective. That is why the system remained almost completely unscathed. Windows 10 is occasionally still rejected by Windows 7 users, as the user interface differs somewhat. While a product isn’t necessarily good simply because it is new, compared to Windows 7, it certainly applies partly to Windows 10 in terms of security. The architecture of the newer Windows 10 and the newly-deployed technologies have a much more rigid approach towards user interventions. Old infrastructures that were included in Windows 7 for reasons of compatibility no longer exist in Version 10. This fact does indeed allow less room for security gaps – but naturally does not protect against new ones. It may be that the Defender embedded in Windows 10 now also works more effectively, but when compared to other traditional Internet security suites, it falls behind. 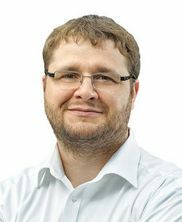 Especially in the detection of malware threats, other solutions are better. That is why every Windows 10 version, maintained and always kept up to date with the latest patch, needs a security suite installed. Those that fit the best are perhaps a matter of taste, but those that provide the best protection are conclusively shown in the current test.